Stay in touch with your community, read the Township Times! Download the current issue of the Township Times below. Want to be the first to know? 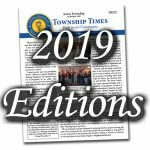 Please subscribe to our newsletter and we will send you a notification each time a new edition of the Township Times becomes available for download.